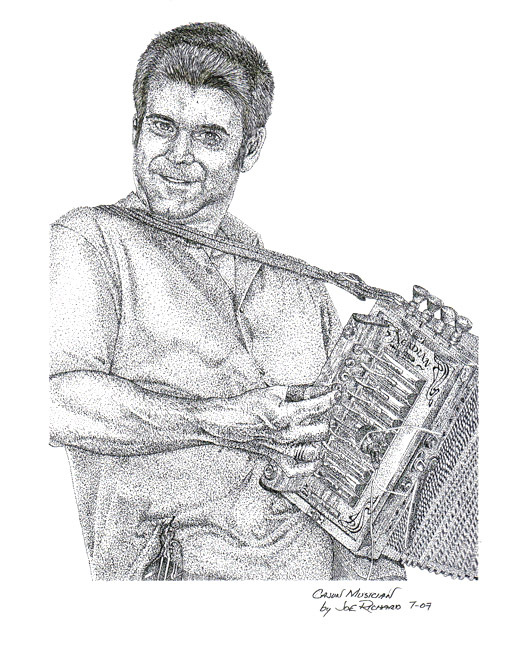 "Cajun Musician" is the fifth in a series of drawings depicting some contemporary Cajuns during our local Mardi Gras. The above pen and ink drawing shows a popular local accoridan artist performing on stage during one of the many concerts held in Acadiana. This study in pen and ink techniques was completed in July 2007. Extensive use of stippling effects combined with some line art was used to create a dramatic finished design in the "Cajun Musician". This work took 15 hours to complete and measures 8 1/2 x 11 inches on a 11 x 14 inch background. This artwork was done on heavy duty bristol board paper. "Cajun Musician" was drawn from a photo taken by a local college professor during one of the many concerts held locally during Mardi Gras week. His photo was used with permission.